Eight tribal artists from Lake Sebu town in South Cotabato have been nominated for the prestigious Gawad sa Manlilikha ng Bayan or the National Living Treasures Award. Roy Uncal, Lake Sebu tourism coordinator, said Friday the nominees are currently awaiting confirmation for the award, which is conferred by the national government through the National Commission for the Culture and the Arts (NCCA). He said the eight artists, who are all from the T’boli tribe, were earlier endorsed by concerned groups and stakeholders for the award, which is considered as equivalent to the National Artist Award. “This is the highest award given by the national government to traditional artists so it’s a major boost to our tribal artists and the T’boli culture as well,” Uncal said. The nominees are: Boi Luming Maguan Tuan and Maria Fe Flang for hegelung (wooden two-stringed lute); Linda Usman Weaver for klintang (kulintang); Rosie “Boi Lemingon” Sula for chanting; Maria “Oyog” Todi for performing arts; Yab Trulan Man and Barbara “Buwat” Kibed Ofong for T’nalak weaving; and, Bernadeth “Nadet” Ofong for Malong weaving. According to the NCCA, if any of the nominees will win the award, it will be conferred by a sitting President in a public ceremony that will be held the Malacanang Palace. An awardee will receive a specially-designed medallion and plaque, with a duplicate set that would be donated and displayed in a provincial museum or the largest cultural center in his/her community. The incentives include an initial grant of PHP100,000, a lifetime stipend of PHP14,000 a month, PHP750,000 in medical and hospitalization benefits, and funeral assistance similar to those received by National Artists. The award, which is includes a program that seeks the transfer of their skills to new generations and the promotion of the craft both locally and internationally, aims to honor and support traditional folk artists and ensure that their skills and crafts are preserved. In 1998, the province had its first National Living Treasure in famed T’nalak weaver Be Lang Dulay, who also hailed from Lake Sebu town. Lang Dulay was known for her contributions in the preservation of the T’boli culture through the tribe’s famed T’nalak fabric. 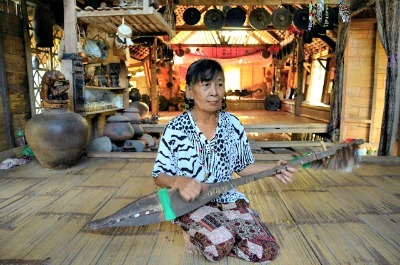 The T’boli princess passed away on April 30 last year at her home in Sitio Tukolefa, Barangay Lamdalag in Lake Sebu. She was 91.